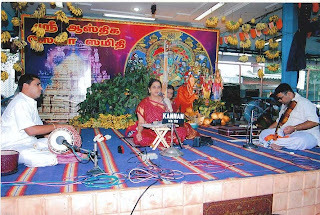 On behalf of Asthika Seva Samithi a grand mahasamrajyapattabhishekam of Srimad Ramayanam was conducted at Ayodhya Mandapam, Mambalam, Chennai from July 21 st to 29th. The very first day an immaculate reception was given to Sri Anna. There were more than 1000 devotees assembled, hence the premises was overfilled with people and suffered from want of space. Everywhere there were only heads visible. It was indeed an impeccable sight. Sri Anna inaugurated the function and in his inaugural speech began “Here is assembled a huge audience which shows your pure love towards me. This affection is only called by the name “ Rama”. Mahasamrajya Pattabhisekam is the recitation of Ramayanam 125 times. Here 125 devotees gathered and recited the Ramayana in one sweet voice. Every day Sri Hari anna delivered the pravachanams in the evenings and Sri Ranganna in the nights. 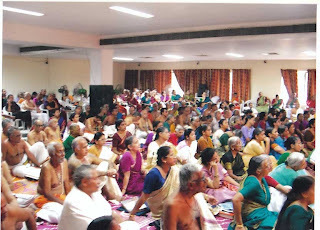 The devotees enjoyed the pravachanams and felt as if they were transported to Ayodhya. Smt Vishakha delivered Shabari moksham and Sow Subadra rendered Sita kalyanam. Sri Anna concluded the function with the Pattabhisheka mahothsavam. 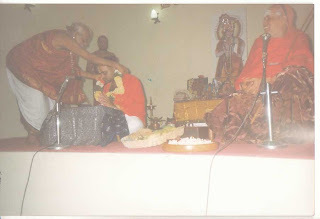 Sri Anna performed the abhishekam to Lord Rama of ayodhya mandapam. 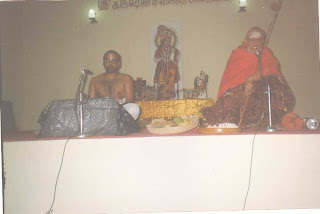 Everyday Raghava shathaka bhajan, Divyanamam and Unchavruthi went on with grandeur. Ayodhya mandapam was immersed in the ocean of people. Kanchipuram is one among the 7 mokshapuris ( cities of salvation). This Mahakshetra is also a divyadesham. Srimad Bhagavatham declares that Sri Balarama swamy while touring the length and breadth of India visited Kanchipuram also. Here there are almost 70 temples.The sampradayas of Ramanuja and Sankara prosper here.Sri Harianna’s sapthaham at kanchipuram was conducted by KanchiKamakoti Sanakara mutt from July 30 th to Aug 5th. 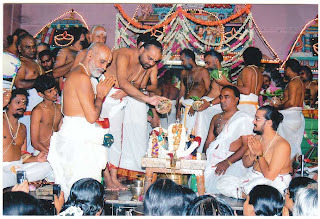 Sri Anna inaugrated the sapthaham with an inaugural upanyasam on the very first day. An extract from his speech is as follows; “ Srimad Bhagavatham is a paramahamsa samhitha. Now it is the time of Chathurmasya. It is very special that this sapthaham is held during the chathurmasya of Periyaval”. 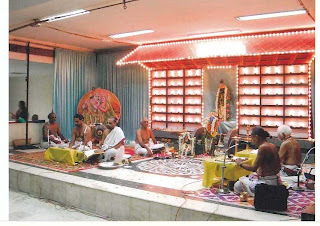 The parayanam and pravachanam was held in the very premises of mahaperiyaval’s adhistanam. Sri Jayendra Saraswathi Swamigal attended and graced each and every pravachanam. Bala periyaval too blessed the sapthahm with his presence. Hari Anna’s pravachanams were filled with Vedantham. He interspersed the pravachanams with slokas of Acharyal. Everyday he reminded one and all of Kanchi Varadan. 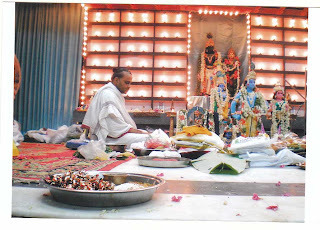 Andal kalyanauthsavam with Varadan was celebrated with grandeur on the day of Adi puram. Hari anna went for the darshan. 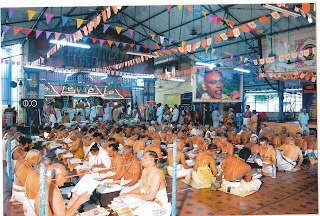 Every year in July/Aug sapthahams are being conducted in Guruvayur on behalf of Sapthaha samithi, Mumbai. 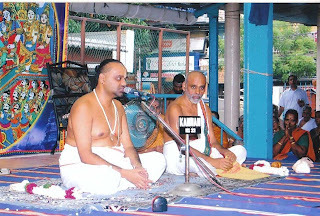 This year the sapthaham at Guruvayur was being conducted from Aug3 to 10th. Sri Anna discoursed the first three days. Hari anna followed. Parayanam and pravachanam was conducted from morning 7.00 to evening 7.00. In between it was blissful to have Sri Guruvayurappan’s darshan.. The devotees were all immersed in the nectar of Bhagavatham. Dates they knew not, days they knew not, the outer world they knew not.. Sri Hari anna while concluding spoke as follows: “ Heart filled with the darshan of Guruvayurappan, ears filled with nectarine Bhagavatham, mouth filled with His Divine name, hands laden with the Bhagavatha book we return home. We have no craving. 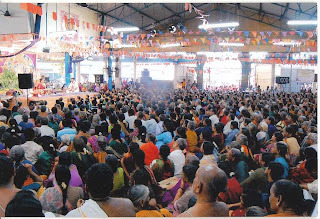 We desire nothing else.” More than 500 to 600 devotees attended the sapthaham. They were provided accommodation, boarding and lodging. All the devotees were well taken care of by the sapthaha samithi.